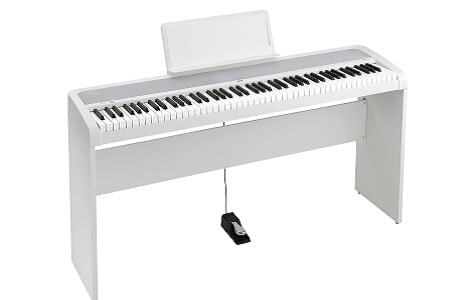 Compact and cost-effective, the Korg B1 Digital Piano is a great choice for all your piano needs. The streamlined design delivers the key features that are most important to any pianist: an authentic keyboard touch, superior sound, effortless ease of use and a stunning design that will complement any décor or setting. Unlike other pianos the B1 is not a stripped-down version of higher models: it is a product all of its own, designed from the ground up and featuring Korg’s cutting-edge sampling technology. The B1 recreates the rich, vibrant tone of an acoustic piano, including the sympathetic string vibrations and damper resonances that give the piano its character, delivering a more accurate, authentic, and expressive sound. 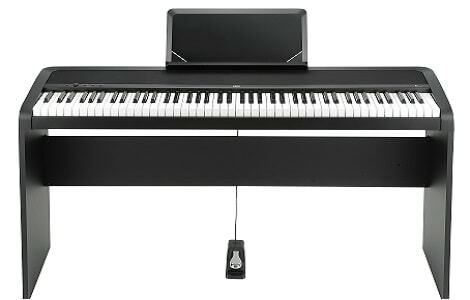 • The B1 is supplied with a piano-style metal sustain pedal. An optional three-pedal unit is also available for control over sustain, soft and sostenuto. the B1-SP version includes a stand and three-pedal unit.